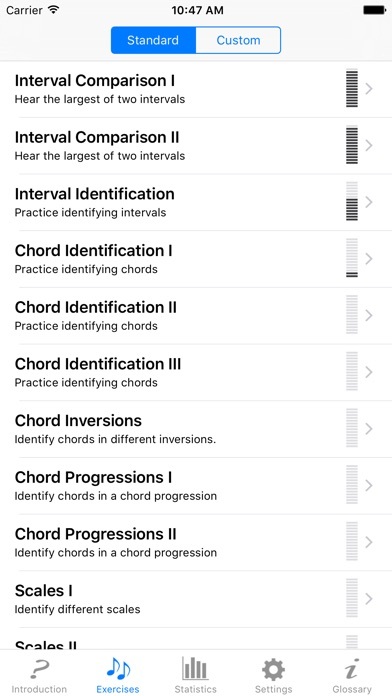 I'm in my second third semester as a music major and I have to say, this is a great app for any music major, or anyone looking for ear training. I like that I'm able to switch between different instruments, it makes hearing the notes on the instrument you're use to a bit easier for me. J'ai testÃ© des nombreux programmes d'entraÃ®nement et de reconnaissance musicale sur iPhone et celui-ci est de loin le plus complet et le plus intÃ©ressant. Complimenti! Grande versatilitÃ e facilitÃ d'uso. Ottima per principianti, ma anche per chi vuole approfondire la conoscenza dell'armonia. La uso sempre con i miei allievi.